There are many different types of birthmarks. Most can be removed. We’ve all seen them and some of us have even been born with them—but the truth remains that no one really knows where birthmarks come from and what causes them. Today we explore the different types of birthmarks out there, we take a look at birthmark removal, and also provide you with some useful information on the costs of such procedures. Vascular: They’re red, purple, or pink, and they’re caused by an anomalous bunching up of blood vessels underneath the skin. Many experts believe that they’re not genetically inherited. 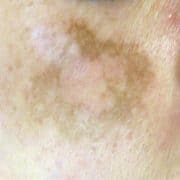 Pigmented: These birthmarks are colored brown and their emergence is caused by a bunching up of skin pigmentation cells. There’s a lot of lore surrounding birthmarks. In some parts of the world, including Southern and Eastern Europe, as well as in some Arab countries, it is believed that the appearance of birthmarks is caused by the unfulfilled wishes or cravings of the mother during the pregnancy. If, for instance, the mother craves grapes and does not receive them while she is pregnant, her child will be born with a grape-shaped birthmark. In fact, the word for birthmark in these parts of the world reflects this notion of the unfulfilled wish: “voglie” in Italian, “antojos” in Spanish, and “wiham” in Arabic. All these words actually mean “wish” or “whim” or “craving”. As explained above, we’re still not sure why birthmarks emerge and why some babies are born with them, while others are born without them. While most agree they’re not hereditary, one cause of specific types of birthmarks might be the production of proteins by the placenta. It’s been noted that birthmarks are far less common in populations of Asian origins or descent. Even though it is unknown why most birthmarks occur, scientists have been able to figure out how birthmarks occur: birthmarks can occur as either a pigmented birthmark or a vascular birthmark. Despite the various appearances that birthmarks may present, a great majority of birthmarks are painless and harmless, and are only a cause for cosmetic concern. However, if you have a birthmark that rapidly changes in appearance, you should get your birthmark checked by a doctor right away, just to be safe. 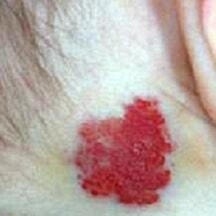 One type of Hemangioma is the strawberry mark. 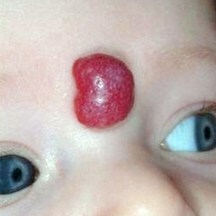 Hemangiomas most often appear within the first few weeks of life and naturally disappear by the age of 10. 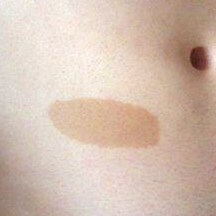 These birthmarks are usually red and elevated, even though they’re small and flat in the beginning. They can appear anywhere on the body, but most commonly develop on the scalp, face, chest, and back. There’s no way to know beforehand if the mark will grow, but, if it does, it’s usually within a child’s first 4-5 months of life. Larger Hemanginomas might actually stretch and can even deform the skin. Although the cause of Hemangiomas is still unknown, we do know how they occur: when an area with endothelial cells which line blood vessels develop irregularly into a tangled bunch of abnormal vessels that fill with blood, a hemangioma is formed. Hemangiomas are technically benign tumors and are the most common tumors than can occur during infancy. Also know as “Salmon Patches”, “Stork Bites”, “Angel Kisses”, and “Macular Stains”. They are usually thin and flat, with a light pink or red hue and most often appear on the back of the neck, the forehead, the upper lip, the upper eyelids, and between the eyebrows. Salmon patches on the face are usually called“Angel Kisses” and tend to fade away in a few years—though they might become visible again, when the child cries. Salmon patches are another type of birthmark with a known cause: certain blood vessels that dilate, causing abnormal groupings of capillaries (tiny blood vessels) near the surface of the skin for about a third of all newborns before or during birth, or within the first few months of life, that result in the formation of salmon patches. Other than skin discoloration, salmon patches have no other noticeable developments and usually naturally fade away in 18 months. Port Wine Stains appear when there is an abnormal dilation of capillaries close to the skin that become tangled and cause a deep red or purple discoloration of the skin to appear. Although the actual cause of port-wine stains hasn’t been proven, it has been theorized that the nerve supply to the affected area has been damaged or is faulty. Port-Wine Stains rarely disappear naturally. Port Wine Stains typically start off pink, but eventually change to a purple or dark red hue (hence the nickname “Port-Wine”). 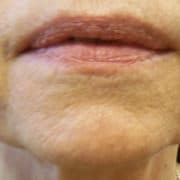 They can occur in various sizes and on any part of the body, but most usually on the face and are generally smooth and flat, but can potentially thicken or develop small lumps as the person ages. According to the UK’s National Health Service, 3 out of 1,000 babies are born with these marks, whose size ranges from a few millimeters to a couple of centimeters wide. 10% of the infants born with port wine stains have them on their eyelids. Such cases require medical attention, especially since they might be an indicator of the Sturge-Weber syndrome, which is an abnormality in the brain. Smooth, round and most likely oval shaped, Cafe Au Lait Spots obviously derive their name from their coffee-like color—in fact, they are a milky coffee color, i.e., a light brown. Individuals who have over four such birthmarks might be suffering from neurofibromatosis: a hereditary condition in which your nerve terminations develop neurofibromas. These can be harmless, or can cause significant distress by pressing down on the nerves and other tissues. 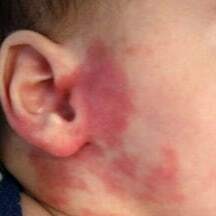 This type of birthmark is present on approximately 1% of U.S. babies and 15% of them have these marks on their neck and head. People with fairer skin have these birthmarks in a light brown hue, while darker-skinned individual display them in very dark brown, almost black. Unlike most other types of birthmarks, these may cause some concern, because they can be lumpy and raised (although they can also be flat). In short, they look like bigger, darker moles. However, they don’t typically increase in size with age, so as the baby grows older, they’ll outgrow them. In puberty, they may also develop hairs. It’s also important to note that these birthmarks come with an associated, if low, risk of cancer, which is directly linked to the size of the spot. Mongolian Spots affect people with darker skin and come in a blue-grey color similar to that of a bruise. They usually fade away by a child’s fourth birthday. They are most prevalent amongst people of an East Asian, Turkish, East African, or Native American descent. Mongolian Spots are flat with an irregular shape and wavy borders. They can occur as one large patch or multiple, smaller spots anywhere on the body, but most usually usually appear on the buttocks or the lower back. 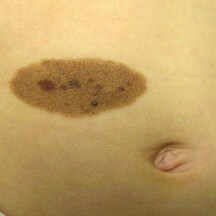 Mongolian Spots are one of the few types of birthmarks that have a known cause. 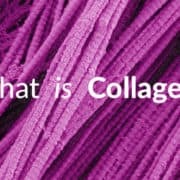 They are a congenital developmental condition (conditions that are present at birth) that disappear within the first four years of life, and develop during embryonic development when melanocytes, the cells in your body that produce melanin, get trapped under the deepest layers of your dermis (skin) while migrating from the neural crest (cells that can generate a variety of tissue and cell types) to the epidermis, causing dark blue spots to appear. Doctors don’t usually recommend removing birthmarks, as many of them are harmless and a large part of them also tend to fade away or disappear on their own. 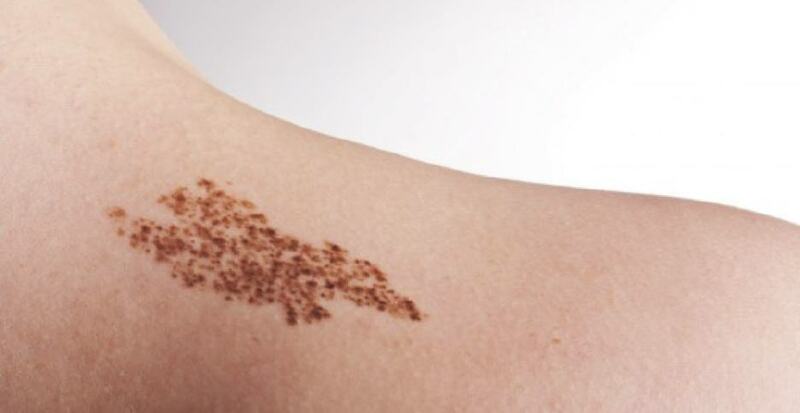 Furthermore, not all birthmarks can be removed, and some treatments may be costly and/or painful. However, if the patient feels strongly about removing a mark, as it causes him/her distress, or if it interferes with a basic life function (feeding, hearing, seeing, breathing), then it should be removed. Birthmark fading with fruit juice. Tomato and lemon juice both contain active substances which can influence the pigmentation of the skin. Dab the affected skin patch gently, with a cloth soaked in juice, 2-3 times per day, for two weeks. Concealing make-up. Some children born with marks can suffer serious anxiety, self-consciousness, and other forms of emotional distress due to the presence of birthmarks in very visible areas. There are several charities around the world which help kids and parents deal with these issues, by providing skin camouflage services. One such not-for-profit is Changing Faces, formerly run by the Red Cross. Though, as explained above, most birthmarks will disappear in time, in some cases surgery and/or medication will be needed. We outline some of the most frequently encountered such cases below, and also explain what your treatment options are. Plastic surgery. This is a viable alternative recommended by pediatricians, in cases in which the hemangioma has deformed or stretched the skin. The reconstructive surgery will try to rebuild the affected patch of skin. Laser treatment. Larger and more complicated hemangiomas can even cause ulcers—case in which laser treatment, surgery, and monitoring will be necessary. This is especially the case for such birthmarks that develop around the mouth or in the genital area, since they can be painful and affect the child’s ability to eat and use the toilet. Some such birthmarks may even appear on a child’s airways—and they will need to be removed with the aid of an endoscope. The procedure is called bronchoscopy and microlaryngoscopy and it can also be supplanted with the drug . In rare cases of an airway hemangioma, some kids will also undergo a temporary tracheostomy, i.e., an opening in their airways, to help them breathe better. Large, painful, and complex cases of hemanginoma can also be treated with medication, such as oral, liquid propranolol. This substance, which is a beta-blocker will cause the birthmark to shrink in time. Bear in mind that the full scope of the side effects caused by propranolol are still being researched by the medical community. If this treatment does not work, your child might also have to undergo treatment with steroids or a medication called vincristine. These birthmarks are permanent and do not go away on their own. If concealing them with makeup is not a viable alternative, you will need to undergo laser birthmark removal. This treatment, in general, works better in young children than in adults (whose port wine stains may become enlarged, raised, and lumpy). The treatment is called pulsed dye laser treatment and sends light 1mm into the skin, through a pen equipped with a fiber optic cable. The light heats up a blood vessel, which then breaks and bruises—but only for a week or two at most. The treatment entails 3-30 sessions spaced at about 6 to 8 weeks apart. It may cause bruising, pain and a sensitivity to natural sunlight which can last for as long as 6 months after the treatment has ended. https://www.amaskincare.com/wp-content/uploads/2018/01/whatisabirthmark.jpg 483 936 Alice Pien, MD & Asher Milgrom, PhD /wp-content/uploads/2017/10/AMA_large_logo.png Alice Pien, MD & Asher Milgrom, PhD2018-01-02 23:51:322018-08-13 19:45:56What is a Birthmark & Does Birthmark Removal Work? 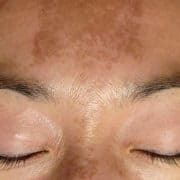 Melasma Causes - What Causes the Dark Spots on My Skin? 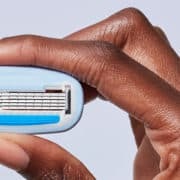 Shaving VS Laser Hair Removal? Which is Better?